We went to the Loma Vista Farm near Vallejo in January and spent a happy morning sketching and painting the fantastic variety of chickens they have. After staring and drawing and trying to understand the way the chickens moved and the way their forms would run and swirl and copy each other, I felt moved to try a few watercolor images. These ongoing sketch sessions are forming the basis for new work which looks at food in a general way and chickens and their welfare in particular. This entry was posted in Art Journal and tagged Art journal, Berkeley, California, chickens, East Bay, east bay landscape, Fran Osborne, sketch, watercolor. Bookmark the permalink. I love these sketches, the shapes are so fluid but no one can mistake what they are. Beautiful! Just discovered your kind comments. Many thanks. 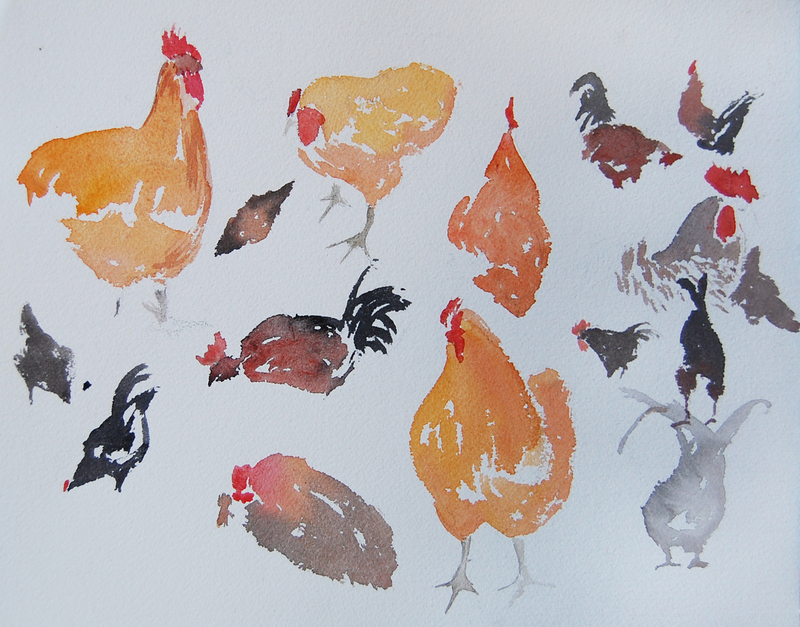 Must get out and do more chickens now the weather is warmer here. I love watercolor sketches & this reminds me of some of the sheets of natural history studies from earlier centuries that I’m so besotted with–and also has a touch of an oriental flavor. Many thanks, a friend sent me a link to your blog and I haven’t had time to explore yet but I will soon. I think watercolor worked well for these studies. We were actually in the hen house for a couple of hours and the chickens were so busy that it was fun to try and capture them, many of the movements were repeated over and over again. Each chicken has a distinct personality and they are fantastic fun to study.